what I hope will be an interesting website. Here is a condensed history of my love affair with that all consuming mistress known as a motorcycle. It all started when I was about ten years old. I saw a rugged looking biker kickstarting an old Flathead Harley. I must have looked consumed because he walked over to me and said something like," you like that boy?" to which I replied "YEP!" He picked me up and sat me on the seat and I felt the thump of that flathead engine and my whole life changed in that moment. I rode my first bike at the ripe old age of thirteen years and eight months old and bought a 1940 flathead 74 cubic inch harley at fourteen. (A Picture of my first love, wasn't she a beauty.) I paid a grand total of $50.00 for her, I wonder if you can buy anything Harley today for that price. Well, there's not enough website to mention all the Harley's that followed, so I will just say that below is my last Harley and between the first and last there were many more. 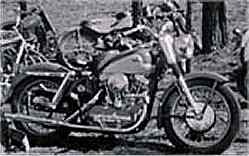 (one Flathead 45 cubic" - one 45 cubic" Servicecar - one Knucklehead - and many Panheads 61 & 74 cubic inchers and one Shovelhead, all hand shift hardtails except the Shovelhead.) I think the grand total including a race bike was 25. 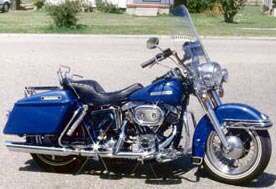 This was my last bike, a 1975 FLH shovelhead that I totally restored in 1989. (Thanks to C&H Jammer and Phil, one hell of a mechanic and a damn good friend.) Due to hard times I had to sell her, but I think there's a gal in Texas happy with her first big twin. 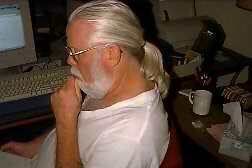 Visit my site often as I will be adding more pages, pictures and stories as time permits. Ok, here is a picture I just found from my past, I had forgotten all about it. If I remember right this was a 1956KH, an early model of todays Sportsters.